Above are some examples of camcorder images in low lighting levels. I tested the Sony TRV900 and TR7000, and Canon GL1 and Elura 2mc. Above each image I have listed the camera model, shutter speed (eg. 60 = 1/60 sec) and gain level applied. All cameras were used in "interlaced" scan mode recording to tape. All cameras are at maximum aperture (f/1.6 in all cases except for the TR7000 Digital 8 which is f/1.4). The maximum available gain on the two Sony cameras is +18 dB, and the maximum on each of the Canon cameras is +12 dB. The shots were moderately wide-angle but handheld, so there is some extra blurring on the slower shutter speeds. The lighting in this parking area is from overhead fluorescent lights, I measured the illumination at ground level by the left rear tire of the tan hatchback to be 3 lux. This is too dim to read by, but enough light not to stumble over things. The images were captured as full-frame (both fields) 720x480 .BMP stills via firewire from each camera and a 260x200 segment cropped from each one. There were no filters or modifications made of any kind. A resized version of the full frame is shown at lower right. If you look at the lower specular reflection of the light on the car's rear side window, you can see that the exposures slower than 1/60 are only using one video field, so the near-horizontal line shows "jaggies". The TRV900 can generate a nice-looking still at 1/4 second exposure but remember this isn't much use if you want video of moving subjects. The compact Elura 2 is the least sensitive of these cameras. Normally the Elura 2 minimum shutter speed is 1/60 but you can select a "low-light" exposure mode which uses 1/30 sec shutter. 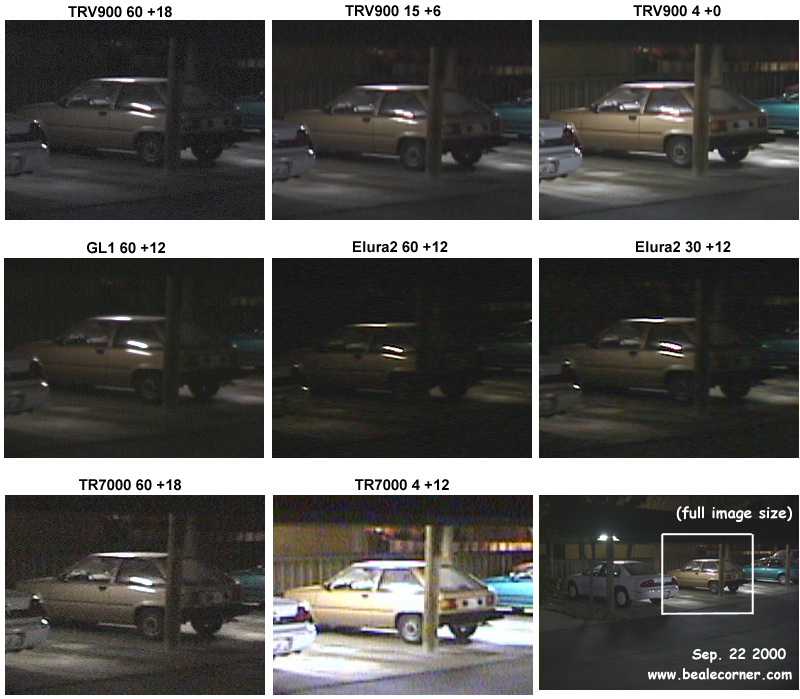 The TR7000 camera has the brightest images but also shows the most grain or video noise. This is a "first generation" Digital 8 but the "2nd gen." (TRV320, 520, 820 etc.) Digital 8's use the same CCD chip so I'd expect them to look the same. Note that this camera is used in its "normal" video mode rather than the "nightshot" mode. The latter mode allows near-IR light to help in forming the image, which helps when there is incandescent light (which actually has more IR than visible). However, it doesn't help much here because the fluorescent bulbs are designed for efficient production of (visible) light and they actually generate very little infrared. The TR7k has built-in IR illuminator LEDs but they only help with close-up shots. Note that the manufacturers' numbers about "minimum lux" tell you little about real performance. This page is a good description of how camera light performance ought to be measured.